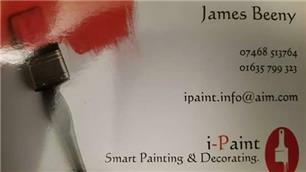 iPaint Smart Painting & Decorating with James Beeny - Painter/Decorator based in Thatcham, Berkshire. I am a local, Quality Painter and decorator who has many years experience within the decorating industry. I offer both interior and exterior work at competitive prices that has no affect on the quality of my workmanship, I always conduct myself in a professional, friendly way, my feedback's are testament to this, My estimates are free and advice can also be given on any other decorating needs that you may need. Please feel that you can email or call at anytime, You can also follow i-Paint on Facebook at i-Paint decorators.